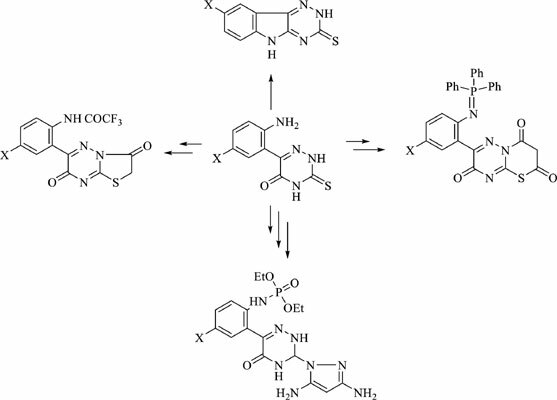 In recent years, a very interest in the synthesis of functionalized 3-thioxo-1,2,4-triazin-5- ones and their derivatives as vital probes has been increased, due to the important, applications of the medicinal, pharmacological, and biological field as a drug, semi drug, and bioactive systems. The present work review outlines extensive recent advances literature survey on the synthesis of sulfurbearing 1,2,4-triazin-5-one derivatives has been reconsidered. Also, the behavior of these family towards electrophilic and nucleophilic reagents in different media and conditions reported. The biological evaluation of the most synthesized systems included anticancer, anti-HIV, antimicrobial as well as their enzymatic effects (cellobiase produced by fungi) have been reported. The reactivity of these systems depends on the polarity of solvent, temperature, molarity as well as a type of tautomeric present. 3-Thioxo-1, 2, 4-triazin-5-one, anti-HIV, biocidal effects, cytotoxicity, α-ketoesters, Sulfur compounds, thioxotriazinone.